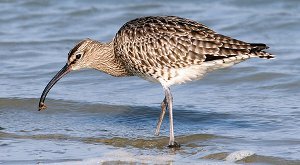 The Whimbrel is a large bird with long curved bill, brown mottled body and a white underside. It's head has two faint dark bands across the crown. 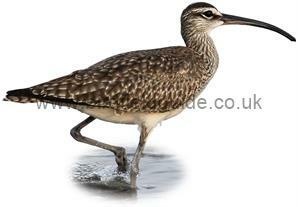 In the UK the Whimbrel can usually be seen in small migratory flocks on mudflats. It can be difficult to distinguish from the Curlew, however the Curlew is larger, lacks any head markings and has a different call. 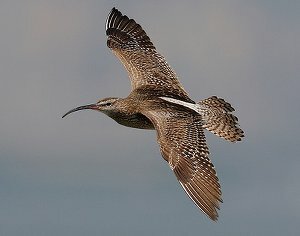 Birds seen during the summer over moorland in the UK are usually Curlew unless seen in the North of Scotland where Whimbrel are known to breed. The long white 'V' on this birds back can be seen clearly as well as the dark wings and bands on the head. Note the Dark bands on the birds head indicating that this bird is not a Curlew which is similar but larger. 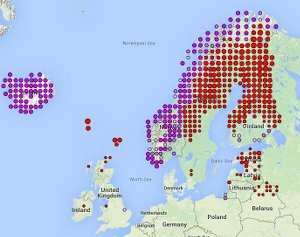 Breeds in the very North of Europe commonly seen as a passage migrant in the rest of Europe. In the UK small numbers breed in the North of Scotland. Considered a red list species in the UK. Breeds on moorland and tundra, in winter is usually found around the coastline near estuaries, marshes and flooded pasture.